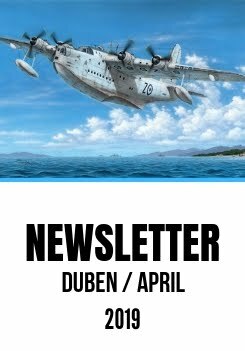 I am sure that our March newsletter will make happy especially those of our Czech and foreign customers who are waiting and asking for the AH-1G Cobra model with camouflages from Vietnam. Highly detailed model from a steel mould that is characterised by very easy assembly. It consists of five sprues with grey plastic parts and a clear parts sprue. The clear canopy is split up into five separate parts and there are also clear parts for the headlights and gun sight in the sprue. The canopy can be portrayed either closed or open. The instruction sheet is printed in full colour and the camouflage section contains four Vietnam-based machines which document the changes in colouring during their combat deployment. The modeller may choose from these machines: Thor´s Hammer, Cindy Ann (bearing a shark mouth), Pandora´s Box and the Gladiator (again with a shark mouth on its nose). As the kit´s name suggests, all the depicted machines were fitted with a M-35 (Vulcan cannon) weapon system. When the SG-38 elementary training glider was designed by Rehberg, Schneider and Hoffmann, its constructors could not have guessed just how famous it would become. This glider very soon became a standard training machine for the NSFK which was mass produced by several factories and it could also be home-built from drawings sent by post. Production was not restricted solely to Germany either and the basic design went on to be built throughout the world, making it the most widely used training glider ever known. The type was built within most European countries under a variety of different designations and amongst them was Slovakia which began production during WW2 and in post war years they continued to be built for aeroclubs in Czechoslovakia as the ŠK-38 Komar (Gnat) where they were used alongside some original ex-German SG-38 aircraft. In this second boxing, there are the very same sprues and also two of them. On the decal sheet you will find markings for the biggest user of this glider which was Nazi Germany and to make the choice more interesting we have added three Slovak machines (one was flying also in the post-war era) and also a German post-war and really nice plane. Fairey Firefly AS Mk.7 "Antisubmarine version"
Fairey Firefly U.8 "Drone version"
Highly detailed figure of a US tank commander. The figure should be placed in the tank´s turret. The commander is crouching in the turret and using the intercom. The figure hands are separate pieces. The set contains two different types of magazines for flares, two signal pistols, two drum magazine boxes and 5pcs of drum magazines. The bigger flare magazine was usually attached on the top of a rear fuselage, the smaller one on the side of the fuselage outside the cockpit. Detailed all resin kit of a German fire pump on a two-wheeled cart. These pumps were used at all German airfields during WW1. The set contains new control surfaces (ailerons, wing flaps, tail plane, elevator and a rudder) for German WW2 fighter plane of the Luftwaffe. For the new Revell U-boot IXC model we have prepared a couple of interior sets. One of these is N72022 Galley set. Three detailed crew figures of German submarine sailors, cooks hard at work preparing the food, can be placed into this area. The set contains two small and two big bomb boxes and 18pcs of bombs. The boxes were mounted outside the fuselage sides. This set is intended for German WW1 aircraft. Detailed all resin kit of a German fuel tank used for aircraft refuelling at all German WW1 airfields. The tank is mounted on a two-wheeled cart. The set contains new interior tub, side walls, pilot´s seat, instrument panel, rudder pedals and other details. It is intended for a model of German WW2 fighter plane of the Luftwaffe and contains pre-coloured photo-etched parts. Copyright © 2015 Aeromodel.eu, All rights reserved.